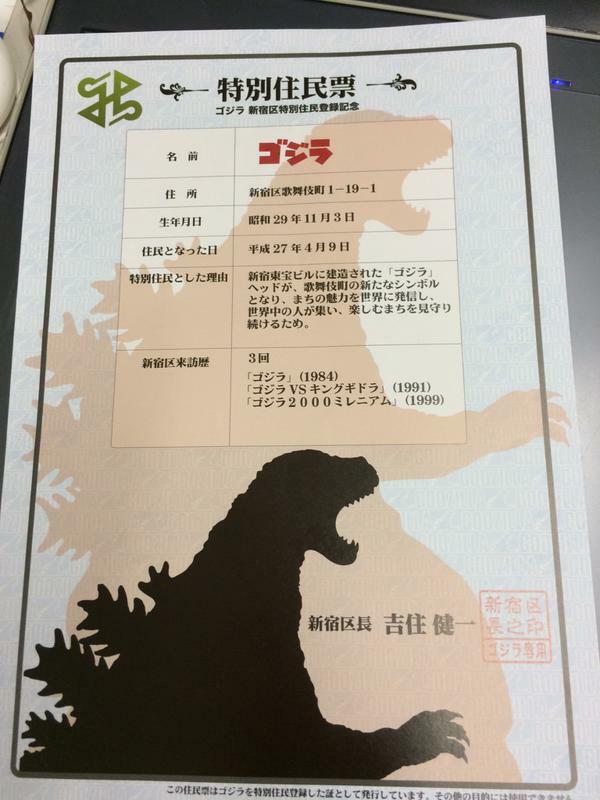 Jared Unzipped: Godzilla Is Now an Official Resident of Japan. Looks like Godzilla is formally a citizen of Earth. Thanks to his regular appearances in and around Japan throughout his multitude of films, Godzilla was recently granted special residency by the Shinjuku Ward in Tokyo. Godzilla made an appearance at the special event to receive this awesome plaque and a stylish sash from Shinjuku mayor Kenichi Yoshizumi. This should come as no surprise. 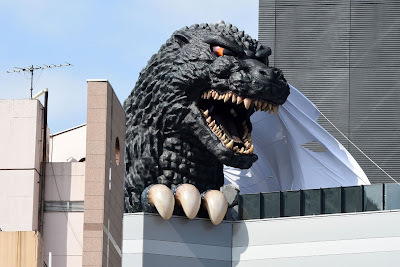 Godzilla's giant head and hand were recently installed on the new Toho Cinemas Kabukicho / Hotel Gracery Shinjuku Complex. The life-size head peaks over the rooftop, which you can then see from within the hotel rooms located there. It's all quite menacing, but intended to be fun at the same time. Godzilla atop the Hotel Gracery Shinjuku. By providing Godzilla residency, the Shinjuku Ward has officially chosen the King of Monsters to serve as the ambassador of international tourism for the city. As an added bonus, the first three thousand visitors whom want an official copy of Godzilla's residency document may do so at any of the ward's various government offices. Congratulations to the big green guy. Even though he's caused trillions of dollars in damage, people still adore him. Now that's what I call unconditional love! Here's a video of the life-size Godzilla installation above the hotel and theater center as it was unveiled. If you skip to the four minute mark, you can see the sculpture from ground level. It's HUGE!